The Liberty Double Eagle was produced from 1849 to 1907. These twenty dollar gold pieces were authorized under the Act of March 3, 1849, which created the new higher denomination coins to deal with the mass of gold being sent to the Mint at the start of the California Gold Rush. The lengthy series is divided into three types, marked by changes in the inscriptions. The original design created by James B. Longacre features the head of Liberty facing left. She wears a coronet inscribed with the word “Liberty” and has her hair pulled back and bound with some curls falling behind her neck. Thirteen stars surround, and the date appears below. On the reverse of the coin is a version of the heraldic eagle holding scrolls with the words “E Pluribus Unum”. The inscription “United States of America” appears above, with the denomination written as “Twenty D.” below. In 1866, the motto “In God We Trust” was added on the reverse within the circle of stars above the eagle. This represented the start of the Type 2 or “with motto” design. In 1877, the denomination was spelled completely as “Twenty Dollars” and other elements of the design were slightly modified. This represented the Type 3 or “twenty dollars” design. A number of important rarities are included within the series. 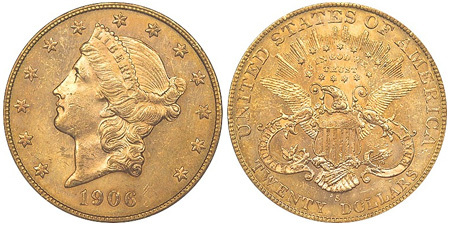 The first is the 1849 Liberty Double Eagle, which has only a single specimen known. Technically a pattern, this was the first double eagle struck within the United States. It is currently within the National Numismatic Collection of the Smithsonian Institution. Another important rarity is the 1861 Paquet Reverse Double Eagle. This coin was created when Anthony Paquet modified the reverse design and an unknown number of coins bearing the new design were struck. After the design was recalled, all examples were melted except for two pieces which managed to escape. Other rarities of the series were created as a result of low mintages and extensive circulation, leading to a very low survival rate. Examples of these issues include the 1854-O, 1856-O, and 1870-CC. For each of these dates, only a small number circulated examples have survived, with no mint state pieces known to exist. The lowest mintage issue of the series is the 1882 Double Eagle, which had a mere 571 coins originally produced. Proof versions of the Liberty Double Eagle were struck in extremely small quantities. Regular production took place from 1859 to 1907, with mintages ranging from 20 to 158 pieces. For three years 1883, 1884, and 1887, the Philadelphia Mint only struck proof versions of the double eagle, giving these proof only issues a special allure with collectors.